Next month ABC will screen the prequel to Prime Suspect, based on the book Tennison by Lynda La Plante. Prime Suspect 1973 is set in 1970’s London, and follows the early career of DCI Jane Tennison (made famous by Helen Mirren). Jane is portrayed by Stefanie Martini (Doctor Thorne, Emerald City). This screened in the UK in March. In this series, we meet Jane as an ambitious, single-minded 22-year-old probationary officer, starting out as a WPC in a world where chauvinism and rule-bending are the norm. Jane’s dedicated, instinctive approach is evident from the start as she is thrown into a brutal murder enquiry, witnessing first-hand the devastating effects of violent crime, as well as experiencing tragic ramifications herself. 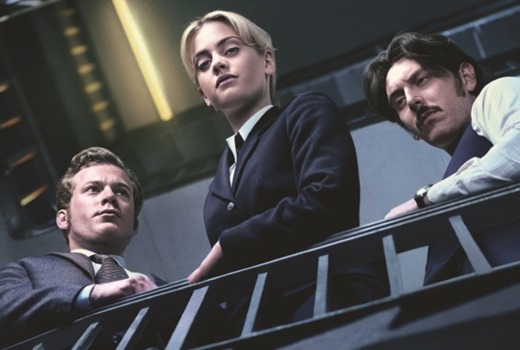 In the first episode, wWhen the body of a teenage girl, Julie Ann Collins, is found in the underground car park of a Hackney housing estate, probationer WPC Jane Tennison (Stefanie Martini) becomes immersed in her first murder investigation. Jane’s superior, the handsome DI Bradfield (Sam Reid), thinks the victim’s drug-addict boyfriend, Eddie Phillips, is hiding something but can’t get him to talk in interview When Eddie collapses, they are forced to send him to hospital. In prison, Clifford Bentley (Alun Armstrong) is desperate to find a way out of an upcoming bank job he and his family are doing for gangland kingpin Clay Whitely. He is visited by his youngest son, David (Jay Taylor) concerned David is paying too much attention to Julie Ann Collins’ murder. At home, Jane’s mother voices concerns about Jane’s chosen vocation and wishes she were more like her younger sister, Pam, who is about to be married. But the murder investigation has its hooks in Jane and she is adamant she’s going to help catch the killer. 8:30pm Friday July 21 on ABC.